‘The Lang Toun ’ Our nearest large town with two indoor shopping centres and a new Leisure Pool. 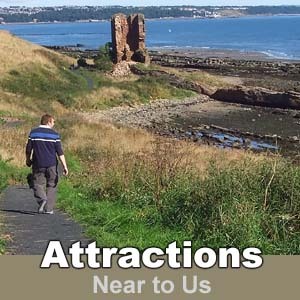 Pleasant walks along the Prom and Sandy Beach and through the Beveridge Park, Dunnikier Park or Ravenscraig Park. Reopening in Spring 2013 after a £2.5m investment The art gallery can boast probably the largest public collection of works by William McTaggart & Scottish colourist S J Peploe outside the National Galleries of Scotland. Also a number of works by the Glasgow boys, as well as modern works and the only paintings by Jack Vettriano owned by a public Gallery. 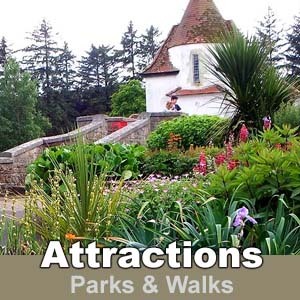 Attractive park with beautiful rose gardens, children’s play park, bouncy castle during summer months boating pond, putting green, tennis courts skateboard and play park and crazy golf. A very attractive town, with many sites to visit. It is the birthplace of Andrew Carnegie and there is a museum in the town dedicated to the great man, in the very cottage he was born in. 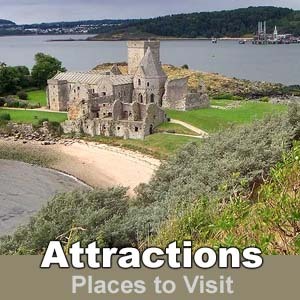 Visit historic sites of this picturesque university town including St Andrews Castle and St Andrews Cathedral and see The Old course and The Royal and Ancient or stroll through the pleasant town centre or walk along the beautiful West Sands beach. One of the finest coastal locations in the historic town.Step through its doors and be transported into an underwater world of adventure and discovery. Come face to face with some of the most beautiful, fascinating and dangerous creatures of the seas 01334 474786. The British Golf Museum is a 5 star museum at the heart of the home of golf, the museum displays a large collection of golfing artefacts and memorabilia etc. 01334460046. About 8000 species of ferns, herbaceous plants, shrubs and trees are grown here. 01334 476452. 1.Edinburgh Castle – Wherever you are in the city, this great medieval fortress perched on ancient volcanic rock is visible for miles. It’s a microcosm of local history: this was the site of Mary, Queen of Scot’s home, headquarters of Cromwell’s invading army and today it hosts the military tattoo during the Edinburgh Festival. 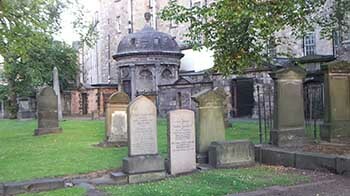 2 Greyfriars Kirkyard – where the most famous resident of all is Greyfriars Bobby the loyal Skye Terrier who kept a 14 year vigil on his masters grave, both dog and his master, John Gray are buried here. 3 Our Dynamic Earth – Step back billions of years at this huge interactive museum, where the time machine takes you back to before dinosaurs walked the earth. You can even witness the Big Bang from the bridge of a spaceship through the Hubble telescope. 4 Royal Yacht Britannia – Now nestling on the waterfront at Leith is the one-time floating palace for the Queen and the Royal Family, used for state visits and holidays between 1935 and 1978. Take a peek at the Queen’s bedroom and one of the Queen’s Rolls-Royces in the on-board garage. 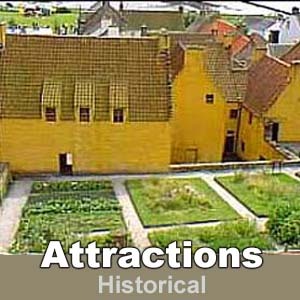 5 Scotch Whisky Heritage Centre – learn all about the making of whisky, the difference between the various types such as single malt, etc, the people who made whisky the worldwide success it is today. 6 National Museum of Scotland – See treasures from the edges of history and trace Scotland’s story from fascinating fossils to popular culture. 7 Royal Botanic Gardens – founded in 1670, is the 2nd oldest botanic garden in the UK. It’s both a scientific institution and a tourist attraction. 8 National Library of Scotland – is the legal deposit library for Scotland , home to about 7 million books 13 million printed items and over 1.6 million maps! 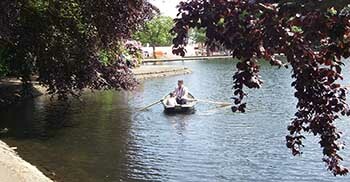 Scotland’s oldest Distllery, with an award-winning visitor centre, go and taste ‘The Water of Life’01764 656565. Visit Stirling castle, or wander through the town, visit the nearby Wallace Monument, in honour of William Wallace, made famous by the film Braveheart or visit Bannockburn Heritage Centre.